The days are getting shorter and you know that winter is just around the corner, so it’s time that you start thinking about the roof above your business. When winter is coming, you need to start winter prep for your commercial roof. Even though we’re fortunate enough in Louisiana not to have to deal with snow and ice storms, that does not mean that business owners can neglect keeping their roof in shape for the winter months. The rain increases, and it is vital that you start getting things ready before it is too late. 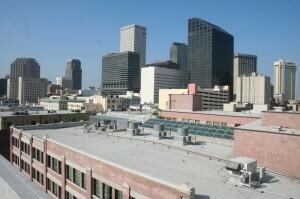 The following tips will help you get your business’s roof in order. This is a very easy way to reduce the possibility of damage to the building. Simply clean out the gunk and debris that builds up in the downspouts, gutters, and drains so that it does not back up and get into the building. By taking good care of the roof, the gutters, and more throughout the year, it makes it easy to get ready for the wetter weather in winter. Of course, one of the very first things that you will want to do when you are getting ready for the winter months is to inspect the roof for leaks. First, check inside and look for any water stains and spots on the ceiling that could indicate possible trouble. Get on top of the roof as well and look for potential trouble spots and leaks. You really need to make sure you do this before the weather gets bad and it starts to rain. The sooner you can catch a problem the better off you will be. You should look at the HVAC units on the roof and see if there are any cracks, punctures, or holes. This could be an entry point for water, and you will need to deal with the issue immediately. Inspect all of the seams and flashing to make sure there are not any gaps or cracks. Use sealants for the small problem areas. Write down anything that you feel might cause potential issues over the winter, especially if you are not able to take care of them on your own. Consider taking pictures as well, as these can come in handy when you talk with the professionals. By being proactive, you will find that it’s generally faster and easier to get the roof into shape. Taking care of problems before they get out of hand makes it a far better option as well. Imagine the damage that a massive leak could cause. It can damage the building, products and tools you store in the building, and can even be a health hazard. Not to mention, the cost of repairing after a leak gets out of hand can be astronomical. Sometimes, you may not have the time or the knowledge to winterize your commercial roof on your own. Even if you do, it may still be a good idea to call in the professionals from JOI Roofing to help you get ready for winter. Having professionals provide an inspection of the roof and to give it a clean bill of health will give you the peace of mind you need for the winter. Additionally, if they find any issues, they will be able to let you know, and then you can figure out what you need to do to take care of them. The professionals can quickly offer their services and ensure your roof is ready to go for whatever inclement weather might be around the corner.